You’ve just found a copywriter who’s been writing effective veterinary marketing materials for local practices, global suppliers, and industry journals since 2000. And, we’ve been speaking, training and consulting on veterinary industry marketing, too. and provided consulting and writing for many other industry clients? Pam started out as a regular columnist for the print edition of this industry journal, and more recently she has been writing for the Vet-Advantage Blog. She’s also been a contributing writer to their print issues and their annual Capital Equipment Guide. As an NAVC staff member and freelance resource, Pam has helped drive record Conference attendance several years in a row as the writer of of the NAVC (VMX) website, email campaigns, direct mail, and more, and she wrote the daily on-site 24-page conference magazine. 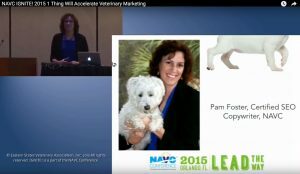 Pam has spoken several times at NAVC Conferences and on YouTube, covering subjects related to veterinary practice marketing and local SEO (search engine optimization). 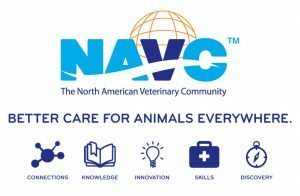 One of the many NAVC videos we presented was this: “The Ultimate Open House Approach to Veterinary Marketing.” Type “NAVC Veterinary Marketing” into YouTube search to see several other presentations delivered by Pam. 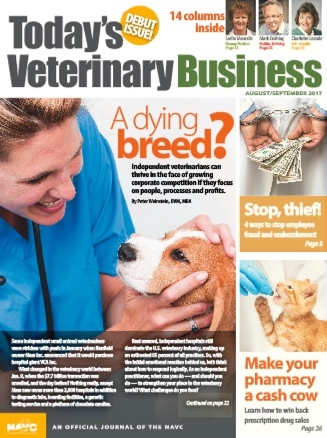 This all-business journal for veterinary practices launched in August 2017, with a number of articles written by Pam. Watch for many more to come! Pam started out as a freelancer for LifeLearn’s signature veterinary marketing platform, WebDVM4, and its robust client education library ClientEd Online, and then joined the team full-time for a period. During this time, she was responsible for veterinary marketing training, promotional copy, speaking, and staff SEO training. She established the company’s monthly campaigns that included free veterinary marketing guides, training webinars, and blog posts. She’s also the voice and scriptwriter of their YouTube promotional video: Veterinary Websites and Marketing System Overview: LifeLearn WebDVM. Craft your messages that will hit home to practice decision makers. We know how to resonate with your audience: veterinary practices and those who work with them — by showing how you respect their dedication, can solve their struggles, help them educate their teams and clients, and make their lives easier with your solutions. Make sure your products and services are viewed as the best out there. For instance, most practices struggle with compliance (why do so many pet owners still skip monthly heartworm prevention? ), so we’ll help you continue supporting staff efforts and client education so practices can improve animal health and pet-owner happiness. And, most practices didn’t learn about business skills in vet school, so we’ll show them how your products and services help them boost business revenue and run things more smoothly. In short, you’ll stand out as your prospects’ hero, so they’ll choose you. What do you need right now to grow your business? Contact us if you need a veterinary industry copywriter now.